The secondtest flight of a Falcon 1rocket built by the private spaceflight firm Space ExplorationTechnologies (SpaceX) has shifted to early March due to range safetydemands at the company's islandlaunch site. SpaceX hadpreviously targeteda mid-February launch date for its secondFalcon 1 test mission, but the absence of key range safety personnel willdelay the flight to no earlier than March 9, Elon Musk,the El Segundo, California-based firm's CEO, said written status update. "We haverecently been informed by the Kwajalein Army Range that they do not havesufficient resources to support our launch in mid to late [February]," Musksaid in the Thursday update. "Several range personnel critical to the launchsafety process will be unavailable in that timeframe." SpaceXplans to launch the second Falcon 1 rocket, the first to fly since thebooster's unsuccessfuldebut last year, from Omelek Island in the west Pacific Ocean [image].The launch site is sits in the Marshall Islands' Kwajalein Atoll, where theU.S. Army houses its Ronald Reagan Ballistic Missile Defense Site. Initiallyslated for a lateJanuary liftoff, Space X officials opted to push back the planned spaceshot to mid-February dueto concerns over a thrust vector control pitch actuator on the Falcon 1booster's second stage. The delay moved the planned space shot beyond its slimtwo-day January launch window, prompting SpaceX officials to stand down untilafter a military Minuteman missile test. The plannedMarch 9 space shot is a second demonstration flight for the U.S. Defense AdvancedResearch Projects Agency (DARPA), which also funded the Falcon 1's failedinaugural launch, and will carry two experimental payloads into orbit, SpaceXofficials have said. SpaceX'sFalcon 1 rocket is a two-stage booster with a reusable first stage designed toparachute back to an ocean splashdown after liftoff. 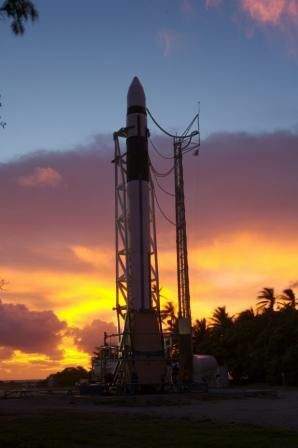 The booster stands about68 feet (21 meters) tall and is designed to lift off from launch pads at theKwajalein Atoll or VandenbergAir Force Base in California. The firstFalcon 1 test launch endedjust after liftoff when a fuelleak and fire caused an engine shutdown 34 seconds into the flight [image].The failure was later traced to the corrosion of a smallaluminum nut. GywnneShotwell, SpaceX's vice president for business development, told SPACE.comlast month that the private launch firm has set up new procedures, such assheltering Falcon 1 rockets instead of keeping them on the launch pads forextended periods, to protect the boosters from the corroding effects of saltwater spray at their seaside launch sites. Earlierthis week, Musk announced that SpaceX is gearing up for three planned Falcon 1launches in 2007. They include the March 9 test, a summer space shot for theU.S. Naval Research Laboratory and a later launch to orbit a satellite for theMalaysian Space Agency. "We arealso building an additional Falcon 1 vehicle in the event that some promisingcustomer discussions culminate in a fourth Falcon 1 launch this year," headded.